THERE’S AN ANT IN MY NECTAR! The level of the nectar feeder has been going down very slowly of late. While this is not particularly unusual at this time of the year, with the Cape Honeysuckle (Tecoma capensis) and the aloes blooming, what has been strange is the behaviour of the few visitors that have alighted on it. 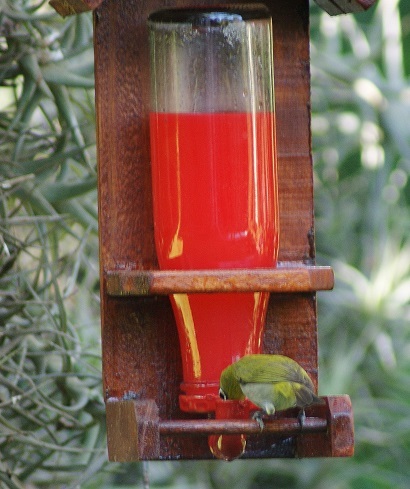 The sunbirds are cautious feeders anyway. Now, one might perch, look around, dip into the feeder once only and leave. Even the robust Fork-tailed Drongos barely perch for more than a second or two: very odd behaviour. Ants are the problem. 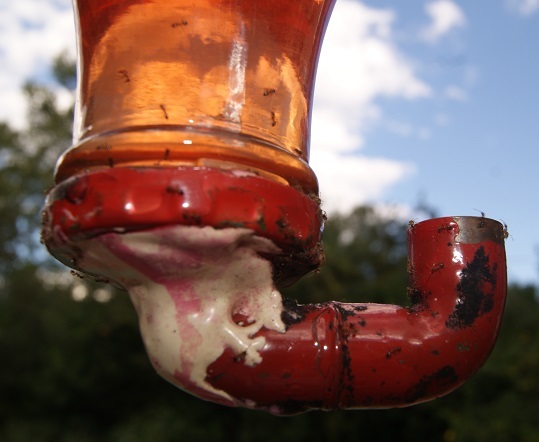 During this prolonged drought, they have fanned out in search of moisture and discovered a lethal source of liquid gold in the spout of the nectar feeder. Lethal, because so many of them are drawn right into the bottle, from which there is no escape. They probably get shoved in ever deeper by the sheer mass of ants thronging around the rim or ‘swimming’ in the opening of the feeder. I now dip a stick into the feeder whenever I go past and when I withdraw it I find the stick crawling with ants. A whole lot of them fell off in a ‘blob’ before I could take this picture. 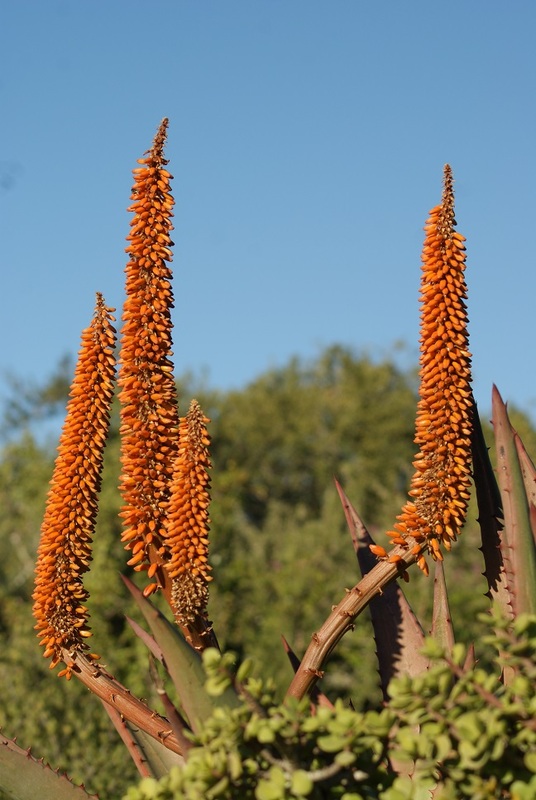 I have mentioned before that the nectar feeder (that I usually refer to as ‘the pub’) is not frequently used when there are plenty of natural nectar sources available – the aloes and Cape Honeysuckle are very popular during winter. The other day, however, I came across a query about the possibility of weavers and white-eyes hogging the feeder to the exclusion of other birds. This led me to pay special attention to the use of ‘the pub’ during the last week of August. 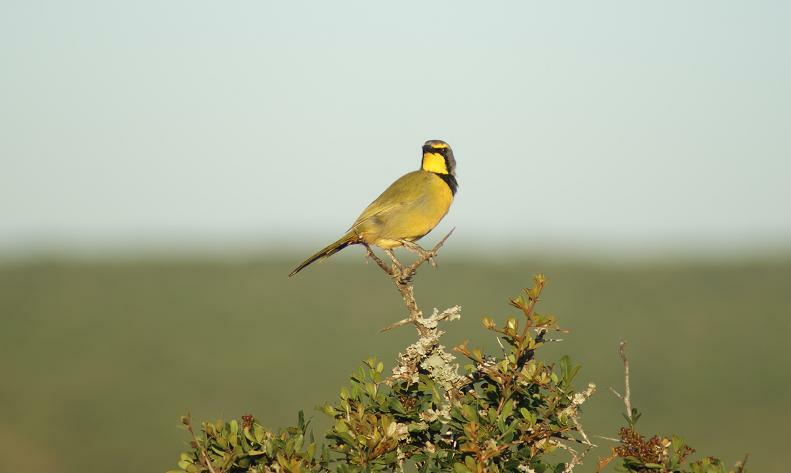 Birds which frequented it during this time include: Forktailed Drongo, Cape Weaver, Village Weaver, Black Sunbird, Cape White-eye, Greater Double-Collared Sunbird, and Blackheaded Oriole. Collectively the weavers are a scrappy lot at the best of times, so it is not uncommon to see one chasing another off ‘the pub’, especially when a lot of them are at the feeding station at once. I was interested to note that the female Cape Weavers appeared to be more aggressive about chasing each other of the perch than the males were. Black Sunbirds tend to make a noise as they announce their approach to the feeder; sometimes waiting their turn perched on a nearby branch and at other times darting in as soon as another bird has left the feeder. They are sometimes chased off by weavers – as are the Greater Double-collared Sunbirds. Male Black Sunbirds tend to perch, look around and then draw from the nectar feeder with intent. Females, on the other hand, make a noise, sip, and look around – repeating these actions until they have had their fill. Cape White-eyes generally approach the feeder either mid-morning or during the latter part of the afternoon when other birds have left to find food elsewhere. I have not observed them chasing another species of bird away – their own kind, yes. 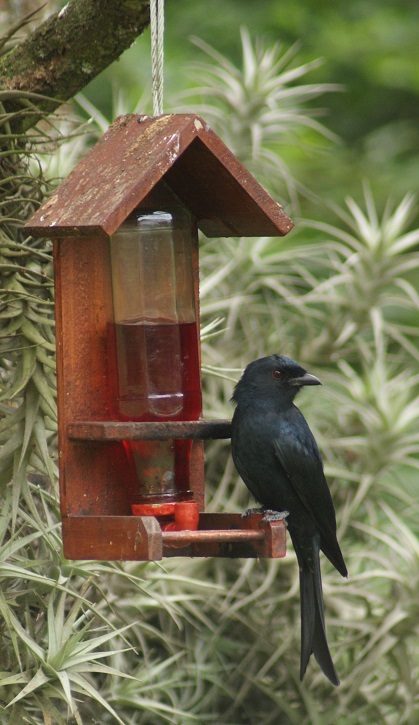 While the Forktailed Drongos do not use the feeder all that often, they do drive other birds away. Sometimes they emit what appears to be an alarm call that causes all birds, from a tiny Bronze Manikin to the much large Rock Pigeon, to flurry off to the safety of branches in nearby trees. On other occasions the drongos literally bump other birds off the perch – especially weavers. I watched three drongos chasing each other off in rapid succession the other day in order to have their turn at ‘the pub’ – none were content to wait. 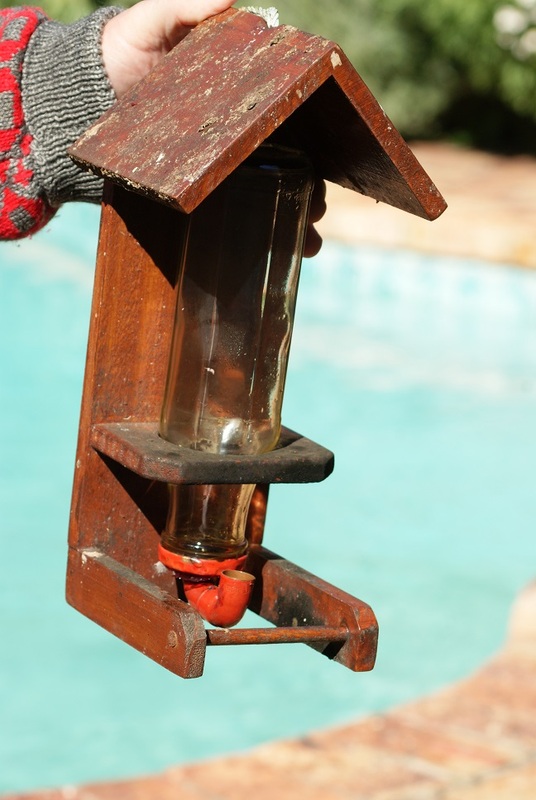 I include a few pictures to show the structure of the feeder: a wooden frame with a hole in it large enough to fit a Mrs Balls Chutney bottle; a hole in the lid of the bottle has a copper u-bend soldered into it. 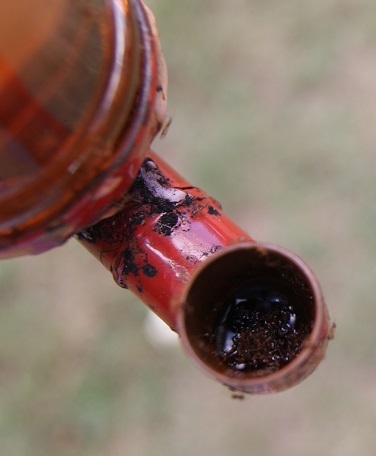 Depending on the weather and the availability of natural sources of nectar, we refill the bottle from once or twice a week to every ten days or so. Years ago I read that providing seed and / or fruit to attract birds to one’s garden does not necessarily make them dependent on it for survival. Having been away for three weeks, I can attest that birds clearly seek their nourishment elsewhere when none is provided on a daily basis for I have not noticed a decrease in them since our return. We have truly gardened for birds, transforming our garden from a cactus haven to one with a wild forested area, indigenous fruiting trees, aloes and other indigenous flowers as well as providing an area with natural grass that is allowed to seed at will. There is actually plenty of shade, water, fruit, worms, grains, nectar and insects for the local birds to live on without them depending on me to augment their intake. I do though – for my own enjoyment when I have tea outdoors and wish to enjoy observing the presence of the birds in my garden. Otherwise the birds feast on whatever bounty they can find. The yellow carpet of canary creeper blossoms and the orange Cape Honeysuckle flowers currently attract Cape White-eyes and Village Weavers; the fig tree hosts African Green Pigeons, Redwinged Starlings and Blackeyed Bulbuls; while the Olive Thrushes appear to be finding all sorts of interesting things to eat after the recent rain – all without any help from me. Two articles appeared in my inbox this week that set me thinking. One suggests that providing food attracts aggressive birds, such as doves and sparrows, to the detriment of indigenous species. Can one get a bird more aggressive than a Fork-tailed Drongo on a mission? 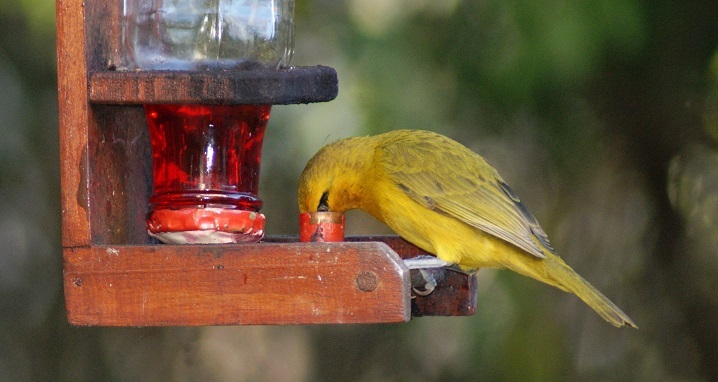 I have often mentioned the way it whips food out of the beaks of weavers on the wing – yet they happily share the ‘pub’ with the weavers, white-eyes, Black-headed Oriole and sunbirds. The other really aggressive bird is the Pin-tailed Whydah – we had a resident one in our garden for years that actively chased away anything from a canary to a Rock Pigeon – yet even he had to retire from time to time to chase his wives or to gather strength for the next onslaught! It is true that the number of Laughing Doves feeding on the seed I scatter on the lawn have increased – I counted seventeen of them perched on the Acacia tree today and often there are many more – but they move off when the seed is done to seek food elsewhere in the garden and wider afield. They jostle for the food along with weavers, bulbuls, thrushes, Bronze Manikins among others – each intent on getting what they can while it is still there and sometimes returning later in the day to glean what had been missed. They certainly do not hang around waiting for the next feeding session. I mix the finer wild bird seed with crushed poultry grain for the hanging feeder as this gives the smaller birds, such as the Bronze Manikins and various canaries a better chance of getting something more suited to them. Granted, the findings described in the article refer to gardens in New Zealand. In South Africa we are fortunate to have a wide variety of bird species that have adapted to urban living and which enjoy the natural food in addition to whatever I might provide. 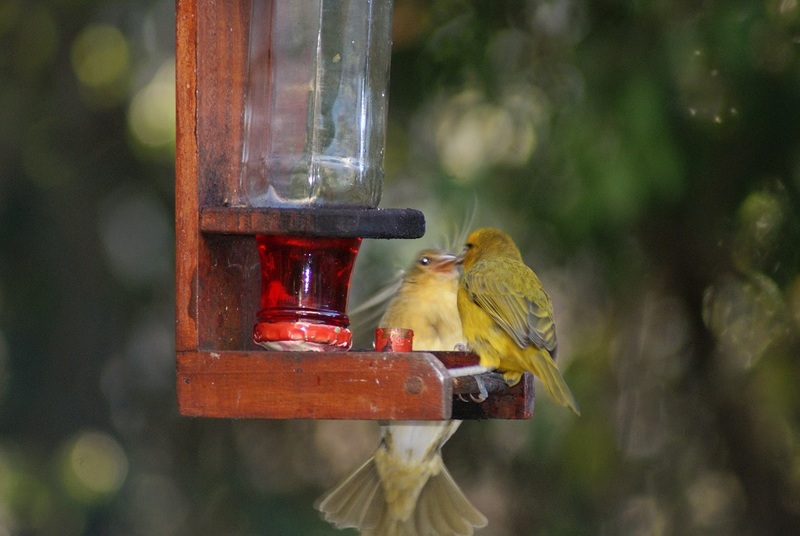 Of greater concern is a warning against using artificial sweeteners in bird feeders. 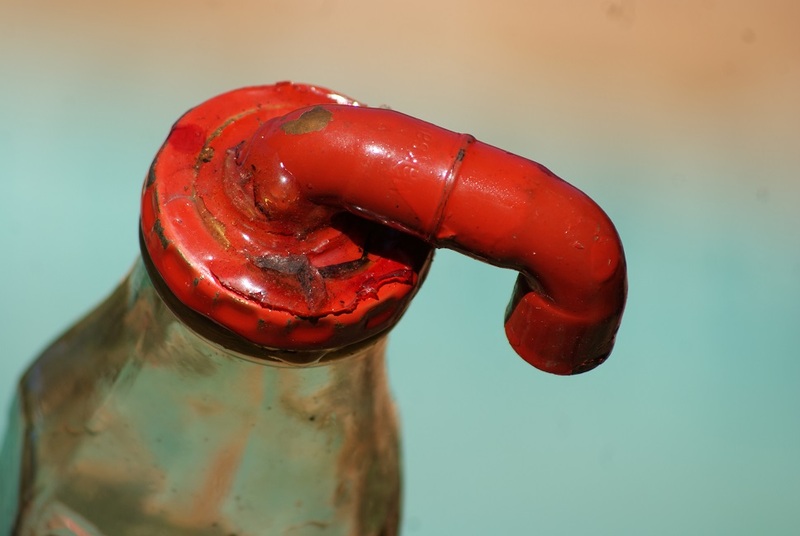 The article specifically mentions Xylitol, an alcohol sugar used in many brands of sweeteners. It refers to such concoctions having caused the death of up to 30 Cape Sugarbirds in one area. 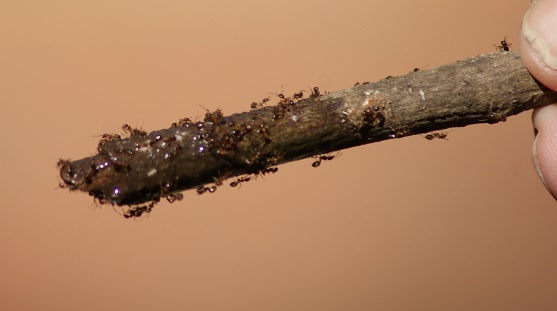 Some people are opposed to the provision of providing sugar ‘nectar’ while others actively encourage the practice – especially in times of drought. My experience is that when there are many other natural sources available, our ‘pub’ is hardly visited at all. 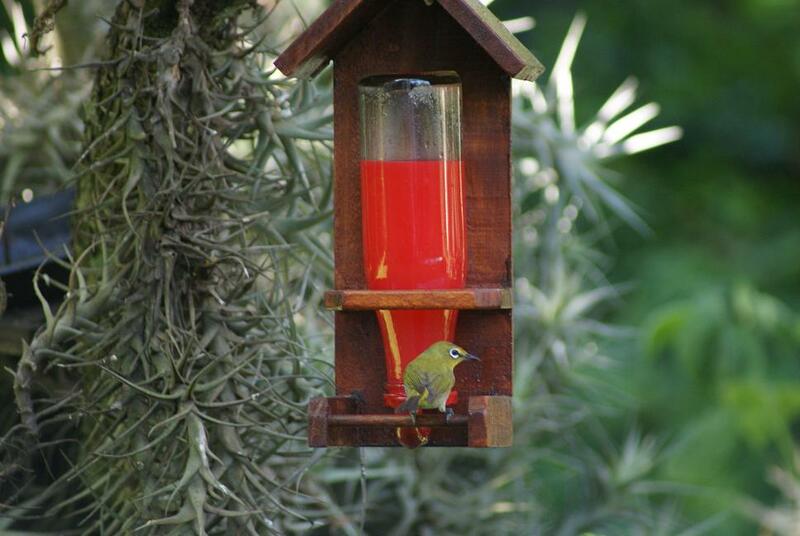 What are your thoughts on providing some food for the wild birds that visit your garden? We woke to the soft sound of light rain early this morning and watched as silvery curtains of raindrops swept past the window in the breeze. Laughing Doves darted out from the shelter of the fig tree to find seeds on the sodden lawn and a queue of birds including sunbirds, Cape White-eyes and Blackeyed Bulbuls, made a beeline for the nectar feeder (‘the pub’) before retreating to some secret place behind the leaves. I listened to the swishing sound of tyres on the wet street and welcomed the dampness of this grey day. We seldom turn our noses up at rain in the Eastern Cape for we so often had to endure long periods without. Water droplets sparkle so beautifully in the sunlight, such as these on a nasturtium leaf in our garden. 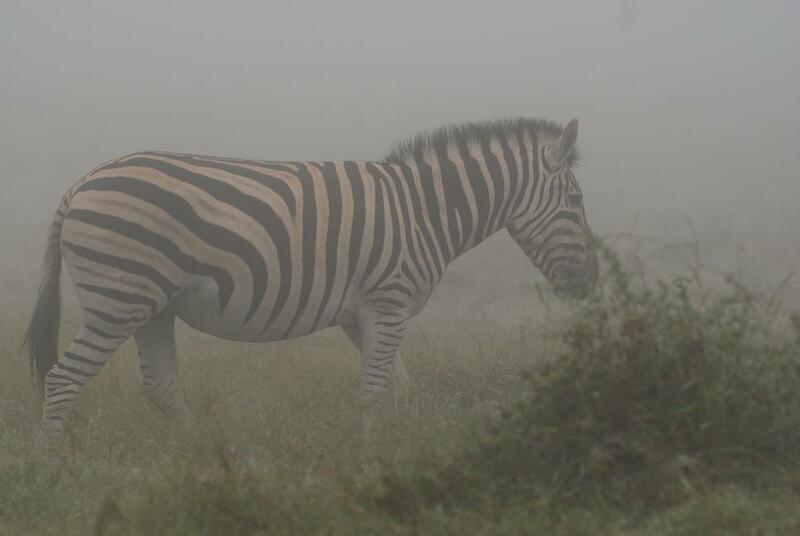 I have already shown the mystery of a zebra appearing in the mist in the Addo Elephant National Park. Usually when we wake to our town shrouded in thick mist during the summer months we know that we are in for a stinker of a hot day. On a rainy day like today though, the heavily laden clouds gently caress the top of the surrounding hills or retreat to form an even greyness that casts an eerie light on the ground. 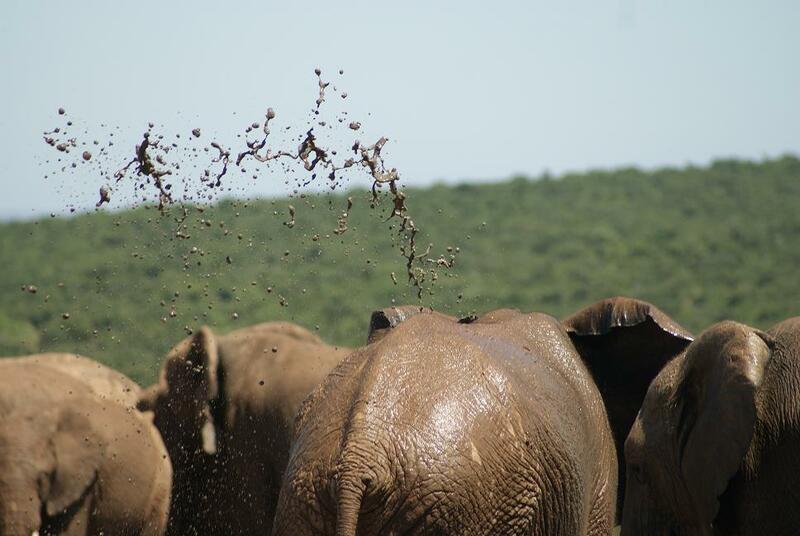 While on the subject of the Addo Elephant National Park, I loved watching this particular herd bathing in a waterhole: they tramped around the edges, squishing up the mud, and squirted muddy water over their bodies until they glistened in the sunlight and changed the colour of these wonderful creatures as the mud dried. 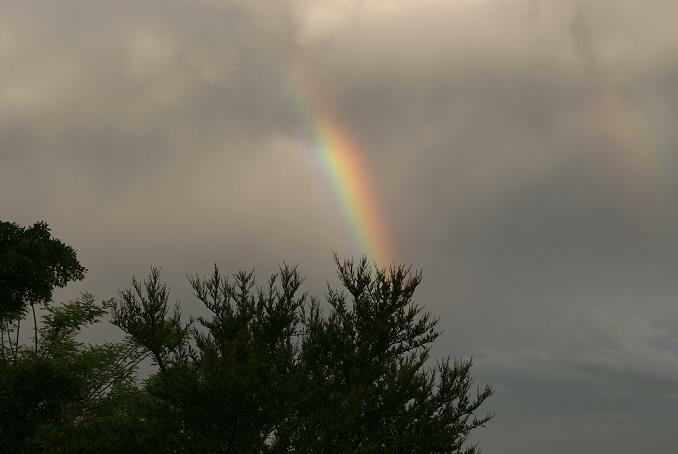 Along with the pattering of raindrops against the window panes and the wonderful excuse to stay indoors on such a rainy day comes the joy of seeing a rainbow – or part of one – peeping through the clouds. I recorded a very pleasing 47 species of birds in my garden during January, the first being a Fork-tailed Drongo. These beautiful black birds swoop down from nowhere to catch insects on the wing, are not averse to drinking from the nectar ‘pub’ and often peck at other food put out for general avian consumption. The last on my list is a male Pin-tailed Whydah. For several years in a row we had a resident one which guarded its territory jealously against birds bigger than itself. It was entertaining to watch its energetic courtship ‘dances’ and the way it chased after the females, hardly giving them a moment to peck a single seed! For the last two years, however, the Pin-tailed Whydah has been a visitor only – and a fleeting one at that. The ‘pub’ referred to earlier was a Christmas gift that has given me endless joy. It is visited regularly by Cape White-eyes, a variety of weavers, the Fork-tailed Drongos and the local sunbirds – the Black (Amethyst) Sunbird, Olive Sunbird and the Greater Double-Collared Sunbird. It has also been satisfying watching a Speckled Mousebird build its nest high up in the enormous Natal Fig that dominates the ‘wild’ part of the garden.